Our Orange County optometrists utilize a special PRIO tester to evaluate your eye’s focusing ability on a computer terminal. 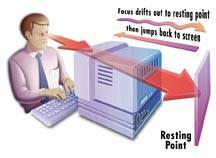 PRIOtm lenses are available in single vision, bifocals and wide viewing progressive lenses to solve most computer eyestrain problems. Please visit their website link at www.prio.com for more information on this eyestrain relieving wonder.